Please advise how can I change the Form Warnings on a Global basis? What I meant is how can I change the Form Warnings that applied to all my forms? Thank you for contacting us. 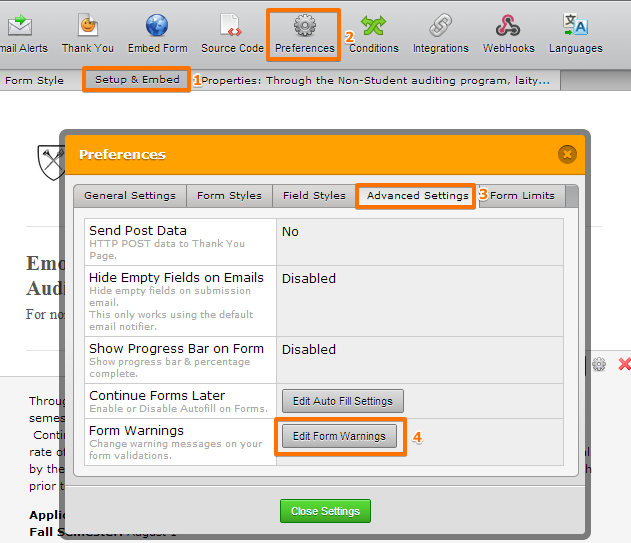 You can modify warnings by going to Setup & Embed > Preferences > Advanced Settings > Forms Warinings. You can then choose your own warning message. New response receivedI know how to change or edit the form warning message. My question is how to change the form warning message once but it can apply to all my forms. Can I change “Please sent” to “Sent” that apply to all the forms, instead of going to change every forms’ warning message.